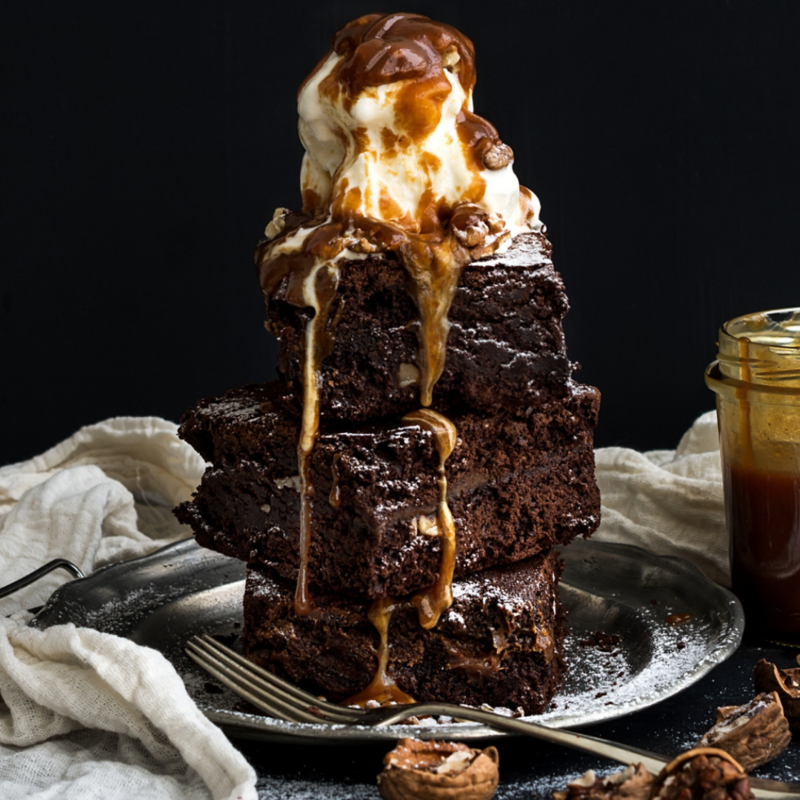 Who else has bake off blues?😭 These salted caramel brownies might help! Grease then line a 23cm square traybake tin with baking parchment. Melt 200g unsalted butter in a medium pan, break in 100g chocolate (70% cocoa solids) and 100g chocolate (50% cocoa solids), then remove the pan from the heat and wait for the cubes to melt. In a small bowl, mix 175g Carnation caramel from a 397g can with 1 tsp sea salt – it will loosen up. Put the rest of the caramel in a large bowl with 200g golden caster sugar and 4 medium eggs, and beat with an electric hand mixer or balloon whisk until even. Whisk in the chocolate and butter. In another bowl, combine 130g plain flour, 50g cocoa powder and a good pinch of table salt, then sift this on top of the chocolate mix. Beat briefly until smooth. Pour half the brownie batter into the tin and level it with a spatula. Using a teaspoon, spoon half of the salted caramel on top of the batter layer in 5 thick, evenly spaced stripes. Spoon the rest of the brownie batter on top and smooth it out, trying not to disturb the caramel beneath. Top with the rest of the caramel in the same stripy fashion. Drag a skewer or tip of a knife through the caramel to make a feathered pattern on the top. Scatter with a little more sea salt, then bake for 25-30 mins or until risen all the way to the middle with a firm crust on top. When ready, the brownie will jiggle just a little when you shake the tin. Let it cool completely in the tin, then cut into squares.